My Grandma Jennings was an amazing lady. I miss her so much. She’s been gone for 7 years now, and I still think about her every day. She was a very elegant, high class lady, that made the most delicious food. I have so many great memories playing at her house as a kid, and I especially loved the meals she made. This year for Thanksgiving, I decided to carry on one of Grandma’s traditions of making a ham, as well as a turkey for the big feast! I love ham, and always looked forward getting to enjoy turkey AND ham when we would have Thanksgiving at her house. I decided to make it a bit easier on me, and tried this recipe for a ham cooked in a crock pot! The verdict?…. It was the most delicious thing my taste buds have enjoyed in awhile! 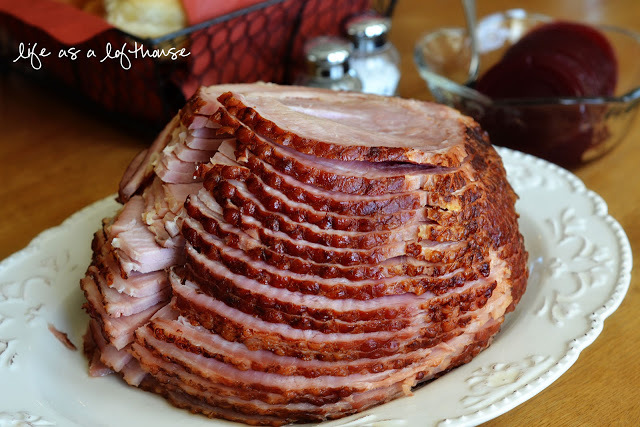 The flavors were so good, and with how easy it was to do, it will forever be my go-to ham recipe! What a great way to prepare ham! 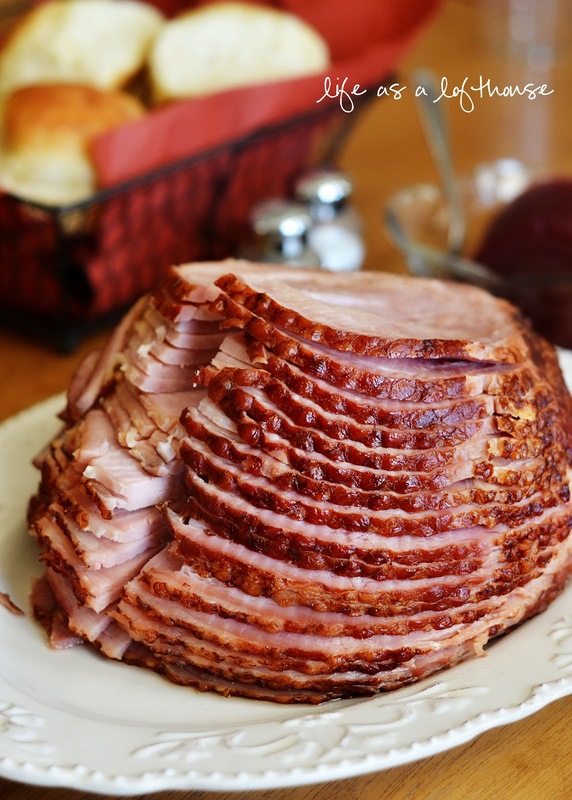 We have ham at Christmas and I’ve been looking for ways to make it! Yum… your ham looks great! This sounds so good. I love the flavor of the pineapple with the ham. That is fantastic! It also opens up the oven for the other baking you have to do! I love this. Thank you for such a great way to cook a ham. It never even occurred to me. This is basically the recipe I use minus the maple syrup. It sounds interesting may have to include that this year. Oooh! I’ll have to try this for Easter this year 🙂 Thanks! There is nothing that I don’t like about this ham, I especially love that it’s your grandma’s recipe! 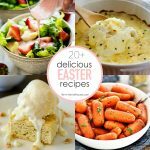 I am making this for Easter today!!! I cannot wait!!! Thank you for this awesome idea!!! I’ve been bragging about this recipe all week!! Yes. 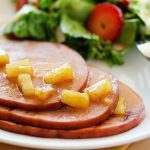 My recipe is: make a paste of 1 cup brown sugar, 1/4 cup pineapple juice, 1/4 cup grainy mustard; rub ham all over with the mixture, I also try to it some of the mixture in between slices; sit the ham on glass baking dish with 1 cup of pineapple juice; cover with foil and bake according to poundage. Yes but I place it in a bcooking bag first and it turns out great!!! Yes, I only do my hams in the oven and they are perfect. I use brown sugar, pineapple juice, a fair amount of ground cloves, add a little some cinnamon and nutmeg, a splash of juice from the merrichino cherries, a splash of maple syrup, a splash of lime juice. Cook the glaze on a stove top until you have the consistency and sweetness you desire. I bake the ham covered in foil in a convection oven at 325 (350 for normal oven). The last thirty minutes of cooking I baste it with some of the juice. Take the ham out, let it sit for thirty minutes, then slice it and cover it in the rest of the glaze. While the ham is cooking, put pineapple pieces and merrichino cherries in a pan with some of the glaze. Cook it covered for 45 minutes while the ham is cooking. Serve the fruit on top of the ham. Delish. We had this at Easter and loved it, so now we are having it again to celebrate falls arrival. It is our favourite ham recipe. This is definitely a must for the holidays! Do I buy a fully cooked ham for this? Bekah, yes, use a pre-cooked ham. My grandson is allergic to pineapple. Do you think it would work with apple juice? Sharon, I think apple juice would work. I’ve not tried it but I think it would be fine. Definitely, works well with any juice!! So helpful! We also have pineapple allergy…..
Apple Cider would probably taste better. It’s more authentic and natural and not loaded up with sugar. It also has more of a tang to it. Sounds better already……….. I just made this last week for the first time. I didn’t have pineapple juice so I used orange juice and it turned out wonderful. Thank you for the recipe, Holly! I have done this but instead of pineapple juice I have used ginger-ale. We had a potluck at work today. Last night I was on facebook and my neice posted your recipe. I was looking for something to take. I saw her post and thought bingo! It was so easy to put together. Everyone loved it. Thank You for sharing your Granny’s recipe. If you have a ready to cook ham I wonder how long it would take?? I don’t like maple. Do I substitute something else or just fix it with the remaining ingredients? I made this exactly as written for Thanksgiving and everyone in my family loved it. There wasn’t any left at the end of the meal except for the juice and bone! Both of which, my grandson took home bean soup and baked beans. This is definitely going into my recipe book! I can’t find a spiral-cut ham, would a regular ham work fine or do you need the juices running down between the slices? I made this, so good I am making again but wonder what to do with all the delicious broth that’s left over? Can I use a frozen ham or do I have to thaw it out? I have never cooked ham before and a little confused. I would not use frozen. Thawed ham would be best! 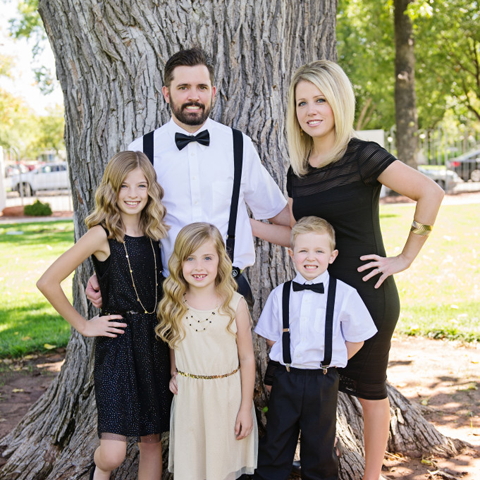 If I am using a smaller ham (2-3 lb, just for my family of five), should I cut the cooking time in half? Yes, I’d cook it for 2 to 3 hours. Could you substitute the pineapple juice for coca-cola? Yes. You can use anything with a high sugar content — some of the best BBQ I’ve ever had uses Moxie. I bet that would be great with the ham as well. Do you have to use a spiral-sliced ham or could it be an uncut ham? Yum! This looks so so good! It’s going on my Christmas menu! 🙂 Pinning! How long would you cook for a precooked ham? Hello! Do you use pure maple syrup? Or the regular pancake maple syrup? Thanks! Would this work with a turkey? Could you use honey instead of Maple syrup ? Yes I was wondering the same thing! Hello! My crockpot is just a tad too small and the lid won’t sit on it all the way. Can I wrap the top in foil of should I cut a little bit off the ham to make it fit? Thank you! Kim, yes that should work! Hello. How long shouldd I cook a 10 Il ham ? I saw this recipe on Facebook and tried it for our Easter ham. 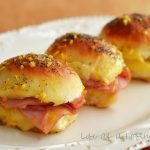 Super easy and the best ham dinner we have ever had! This is a definite keeper! Can a fresh ham be used in the crockpot ?? I love this recipe, I will be trying it for sure. I usually boil my hams in ginger beer and then finish then off in the oven with a marmalade/chilli/paprika glaze but yours sounds divine. I would not have though to use a slow cooker either but I guess you get similar results from the steaming and the cooking in the pineapple. I made this for Easter dinner for my Fiancé and me, and I have never seen my man so happy! We love the tons of leftovers, and the ham is going with everything! Cooking this Ham for the 2nd year in a row now &’& My Family absolutely LOVES it.! 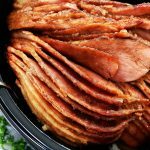 I myself never liked ham until i tried this recipe. Thanks so much for the amazing recipe. It’s become a tradition in our home and even the pickiest eaters love it! 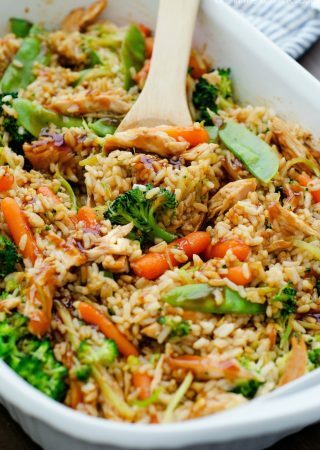 Do you add water to the crockpot? Realized last minute my crock pot is not big enough for the ham. I was researching and I think I will slow roast it in the oven at 250F. Any suggestions?